This 4-year-old's viral love letter will warm you heart. 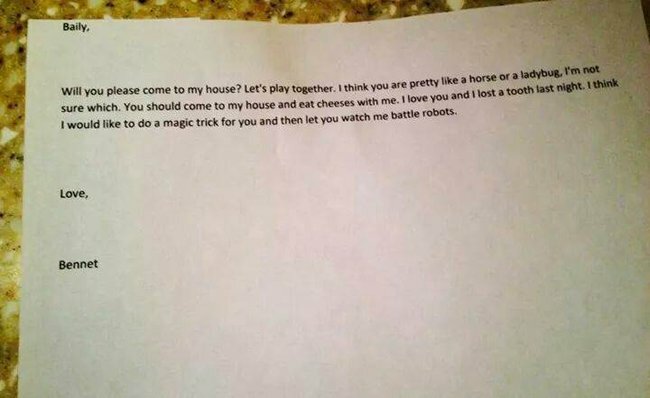 A preschooler's love letter to his crush is the best thing you'll read today. Who wouldn’t want to receive a love letter like this? Four-year-old Bennet has definitely won over the hearts of the internet this week after a love letter he wrote to his pre-school crush, Bailey, went viral when it was posted to Reddit. In the letter he tells Bailey, “you should come over to my house and eat cheeses with me.” This sentiment follows a display of romantic compliments from Bennet telling his crush that she is pretty; like a horse or a ladybug. He even goes on to use the L-word and confesses that he lost a tooth last night. It’s a sweet reminder that we all need to be putting pen to paper and sending some old school love every now and then. Bennet’s mother, Jennifer, has spoken to Buzzfeed telling them that the global response from the letter has been a welcome distraction as she waits on one of her son’s last cancer check appointments. ….We just hope Bailey likes cheese. 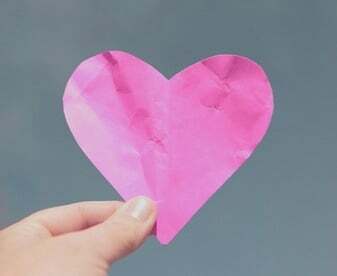 What is the best love letter you’ve ever received? Can you beat this?